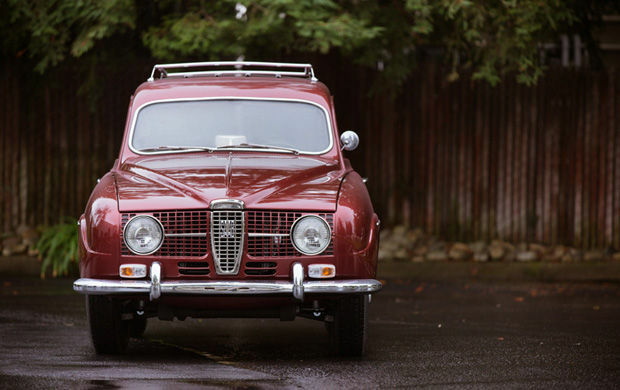 Auction house Gooding & Company had an auction in Scottsdale Arizona in January 2013 and one of the 104 lots auctioned was a 1967 Saab 95 wagon V4. 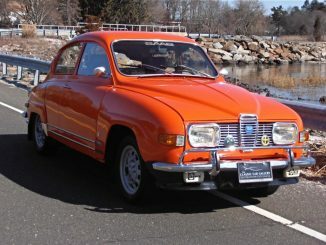 It is not very often you see a vintage Saab that is sold for such a high price. 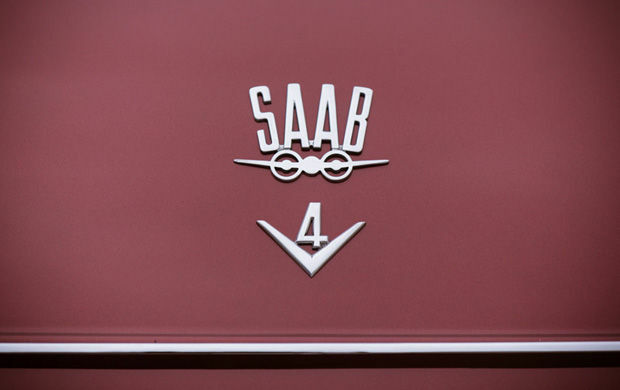 Perhaps the collectors market is taking notice and sees the importance and value of these Saabs, together with the quality work of the restoration. 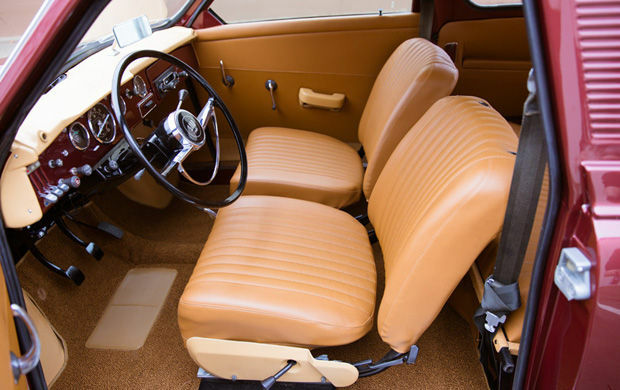 This Saab 95 was completely restored and only had driven 10 miles since then. The car had a few owners and was in storage for twenty years since 1990. It has been in California for all of its life. It was a ground-up restoration and it is now probably better than it was new. 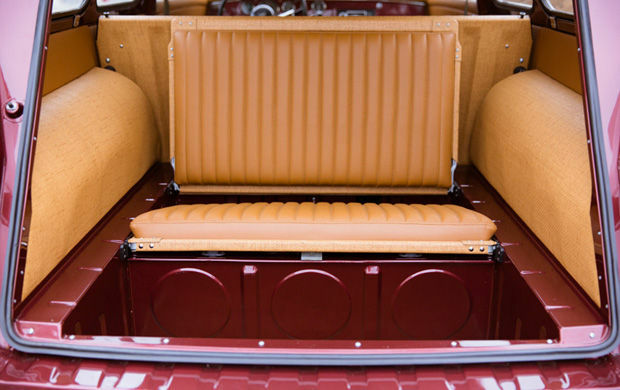 Interesting details are the non-original paint using a Mercedes wine color and the seats upholstered in MB-Tex. SAAB (Svenska Aeroplan Aktiebolaget) began as a Swedish aircraft manufacturer. 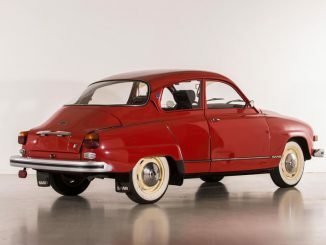 Looking to spread its wings, the company applied its engineering knowledge to the automotive industry and introduced its first car, the SAAB 92, in late 1949. 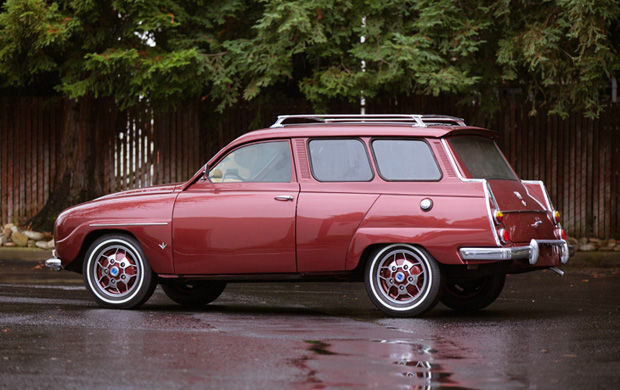 The 95 Wagon, a vehicle suited to the challenging Scandinavian climate, was produced from 1959 to 1978 and last sold in the US in 1973. The 95 Wagon gained racing acclaim when SAAB rally legend Erik “On the Roof” Carlsson made a strong finish in his 95 at the 1961 Monte Carlo Rally. 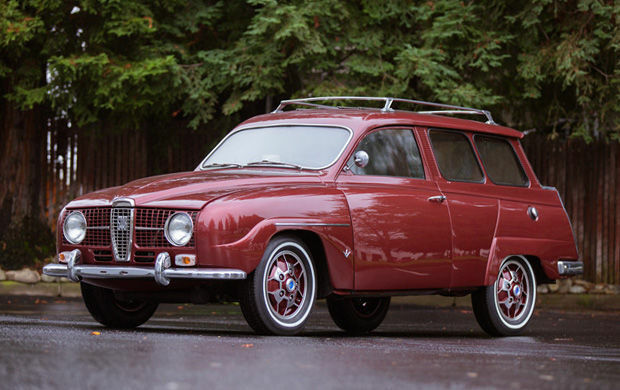 This front-wheel drive 1967 SAAB 95 is an engaging two-door, seven-seat wagon with a folding, rear-facing seat. 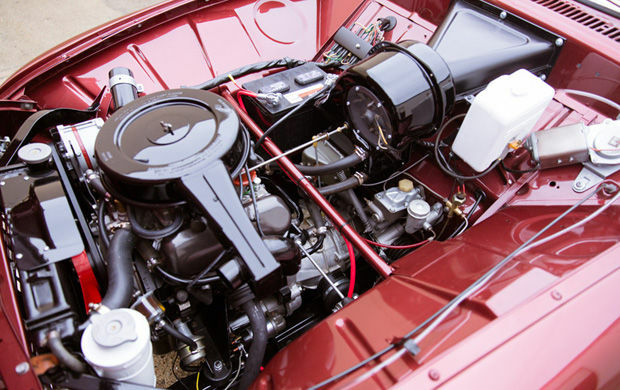 The consignor reports that it was originally purchased in Northern California in 1967 and sold 12 years later to another Californian, who rebuilt the engine and had the car repainted. In 1990, the 95 Wagon was put into dry storage where it remained for 20 years. 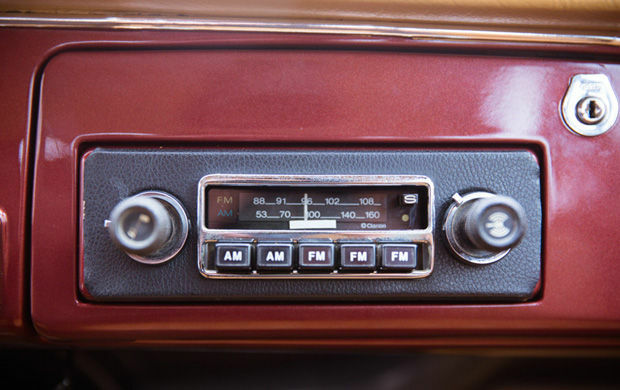 When the current owner purchased the car, it emerged from storage showing no sign of damage; and his original intention was to perform a “minimal” restoration. 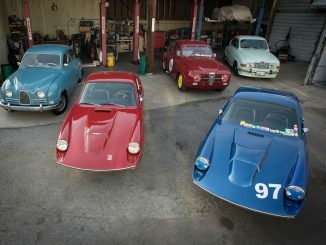 As is often the case with labors of love, the restoration effort ultimately segued into a remarkable all- encompassing, photo-documented, ground-up affair, with European specialist Igor Boun of Northern California carrying out the high-quality paint and bodywork. The Wagon’s exterior now sports a Mercedes-Benz code, deep wine metallic finish and the interior has been redone in Palomino MB-Tex weave with bamboo rattan pattern accents in the cargo area. The V-4 engine has been rebuilt; the transmission seals, gaskets, and bearings were replaced as needed. All front-end components and bushings were also replaced, and the front and rear brakes feature new rotors, pads, wheel cylinders, and calipers. The carburetor, wiper motor, brake and clutch master cylinders, starter, alternator, water pump, steering rack, and CV joints were also rebuilt. To complete the look, SAAB Sonett “soccer ball” alloy sports wheels were added, featuring body-color inserts and polished details. Period whitewall radials add to the 95 Wagon’s deluxe, vintage façade. Upon inspection, this car presents virtually flawlessly, with every conceivable aspect of renewal having been addressed during its nut-and-bolt restoration. The result of all this effort has produced what is likely one of a handful of concours-level SAABs in the world. 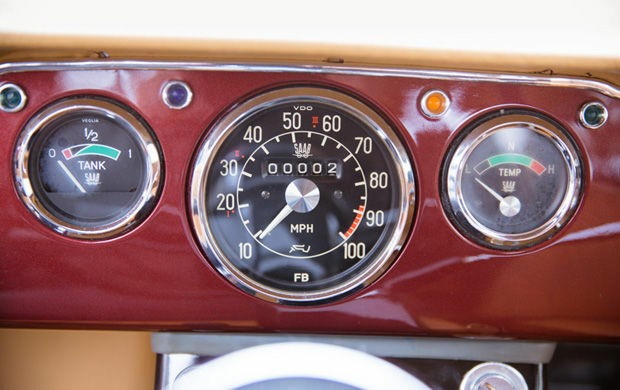 At the time of cataloguing, just 10 miles have been put on the car since its extensive refurbishment. 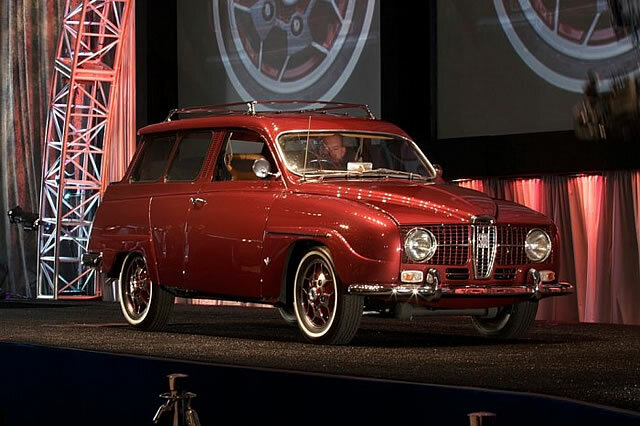 This meticulously presented SAAB 95 Wagon will make a unique and crowd- pleasing concours entry or it can take a special place in any eclectic automobile collection.